The EU appears to be poised to deal a major blow to what Chinese officials and call a politically charged campaign against Huawei, as the bloc's executive branch is reportedly preparing to issue a recommendation for 5G development later this week that ignores the US' call to oust Huawei. In the recommendation, the European Commission will urge member countries to share more data to tackle cybersecurity risks in the 5G era but will not issue a ban on Huawei participating in the rollout of 5G in the EU, according to Reuters. European Commissioner for Digital Single Market Andrus Ansip will present the recommendation on Tuesday, which, though not legally binding, carries political weight, Reuters reported on Saturday, citing unidentified sources. "This is more of a pragmatic approach, which fits into the Europeans' consistent practice," said Chen Xin, research fellow and director of the economic division of the Institute of European Studies at the Chinese Academy of Social Sciences. "Major European powers probably figure out the best move forward is a balanced approach." 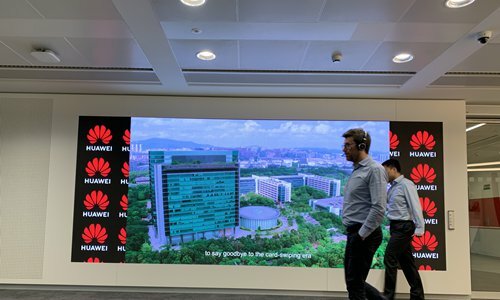 The move allows the EU to use competitive products from Huawei to help its 5G rollout while also leaving room for technological solutions to tackle cybersecurity risks, Chen noted. However, by making the move, the EU also wants to show that "it is not controlled by anyone, including the US," dealing a major blow to the US politically charged harassment against Huawei, according to Chen. "The Europeans are viewing this as pure technology issue, while there are many ulterior motives behind the US' move," he said. Chinese officials and experts have defined unsubstantiated security warnings against Huawei from the US a political hit job to unfairly stave off competition and contain China's rise in technology. The EU's planned move on 5G would follow another blow to US officials' efforts to block Chinese-EU cooperation, in this case under the Belt and Road Initiative (BRI). Ignoring US officials' warnings, Italy has signed a memorandum of understanding with China to join the BRI. "The EU-China relationship is a very unique relationship… Europe is not rejecting China," Shada Islam, an expert at Brussels-based think tank Friends of Europe, told the Global Times on Friday, noting that the EU needs China on a wide range of issues from climate change to renewable energy. "So Europe is not caving to American pressure." However, there are clear differences between China and the EU over certain issues including access to the Chinese market for EU companies. In a recent policy paper, the EU labeled China an "economic competitor" and a "systemic rival," causing some concern in China over the future of China-EU ties. "Overall, there is more cooperation than competition between China and the EU. We should not read too much into the labels," Chen said, noting that the EU's characterization of China as a rival is far less hostile than the US calling China a "threat."